Little Italy Baltimore Coupons - What if you could tell any local business exactly what you want and had them customize a deal just for you? Simply download free app and take 15% off your entire bill. 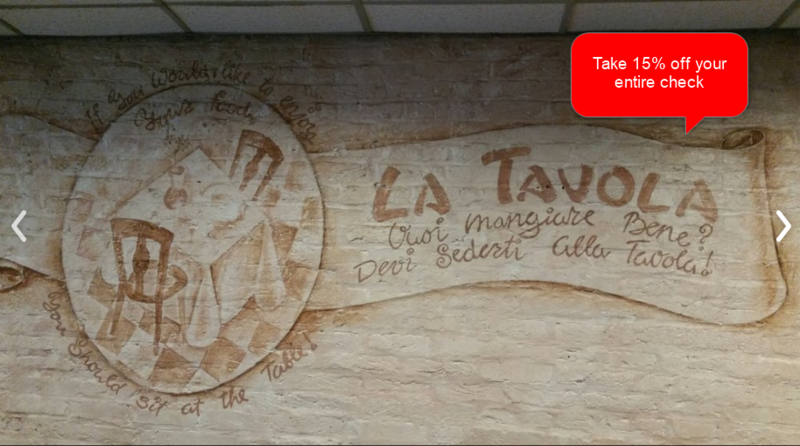 Show your app at checkout, get it validated and save big at La Tavola and other restaurants in Little Italy Baltimore. Simply select the coupon you want to use, show it at checkout and Save Big !Download Free new app launched in Baltimore, Howard County, Towson MD. Over 400 “local Baltimore, Towson, Howard County business owners” have created coupons in the app to attract customers to their businesses. Save Big with Custom Coupons made just for you!